When getting up, experiencing a sudden drop in blood pressure may lead to dizziness or lightheadedness. It could be attributed to dehydration or medication, but new research shows that it could signal an underlying medical condition. According to a new study published in Neurology, people who frequently feel dizzy after getting up may be at a higher risk of a condition called orthostatic hypotension (OH). OH is when the blood pressure lowers after one changes position—it could occur within three minutes of getting up or sitting down. A team of researchers at the Harvard Medical School in Boston, MA analyzed the medical records of 165 people who had undergone nervous system testing—a test that determines whether the autonomic nervous system is functioning properly. The participants had an average age of 59. Out of the 165 individuals, 48 had been diagnosed with delayed orthostatic hypotension (DOH), 42 had been diagnosed with OH (a more critical form of DOH) and 75 had neither condition. During the decade-long follow-up period, the team discovered that 54% of individuals with DOH progressed to OH, while 31% developed a degenerative brain disease (i.e. Parkinson’s disease). Participants with DOH who also had diabetes at the beginning of the study were more likely to develop the full condition compared to those who didn’t have diabetes. The rate of death for participants who had DOH was 29%, while it was 64% for participants with OH. The rate of death for participants with neither condition was nine percent. For participants with DOH that progressed to OH, the death rate over the 10-year period was 50%. Researchers admit that the findings may not apply to the general population—study participants, after all, were referred to a specialized center for nervous system testing. Gibbons, C.H. and Freeman, R., “Clinical implications of delayed orthostatic hypotension: A 10-year follow-up study,” Neurology September 23, 2015, doi: 10.1212/WNL.0000000000002030. 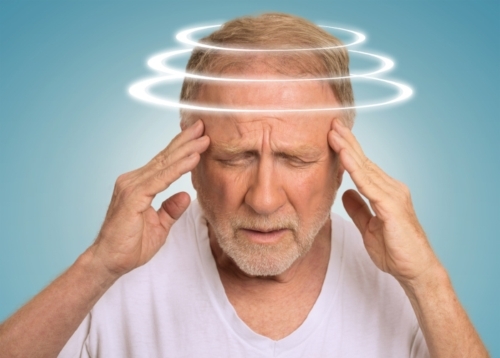 Vernon, J., “Dizziness after getting up may indicate a serious health problem, study finds,” Medical News Today web site, September 24, 2015; http://www.medicalnewstoday.com/articles/299845.php.